"Taking the obvious Livermore trail - Tripyramid trail loop route (clockwise) from the Waterville Valley trailhead at the end of rte 49. 11 trail miles, 7 hrs book time. Possible tricky spots: N Tripyramid slabs and S Tripyramid slide. Anyone interested?" 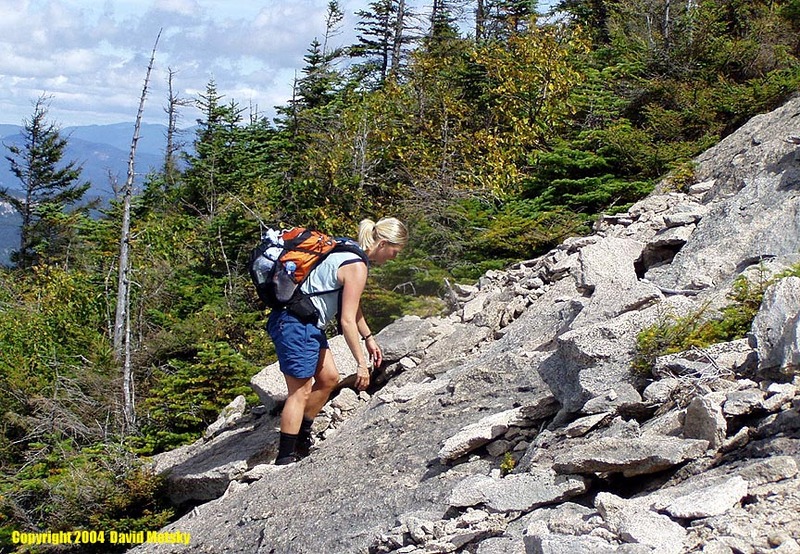 "Possible tricky spots: N Tripyramid slabs..."
"Caution: The steep rock slabs of the North slide are difficult, and they are dangerous in wet or icy conditions." Well, duh. This is pretty mild in comparison with its description of the Flume Slide on Mt Flume ("extremely steep, rough... extremely slippery when wet... nearly always wet... not recommended...discouraged"). Having climbed the Flume Slide solo on a very wet and icy spring day (scary at times but not too horrible), I figured the North Slide would be nothing more than a bit of spice along the beginning of a three-peak loop over Tripyramid. 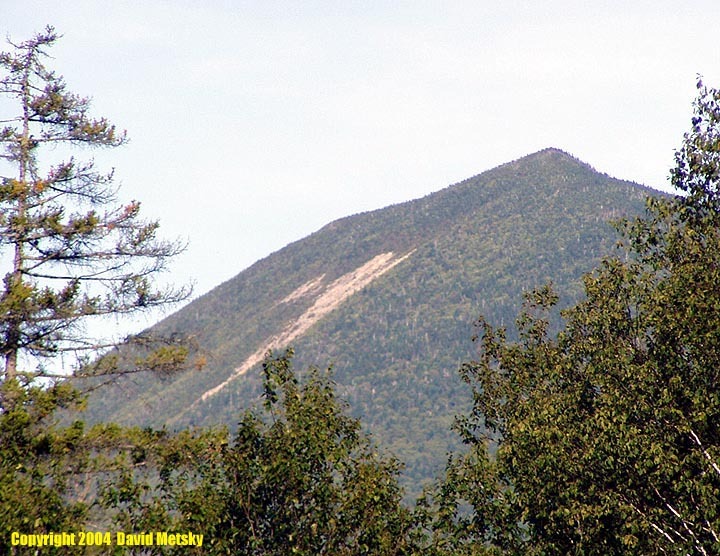 I might have had a more realistic frame of mind had I read Summitpost's own Mt Tripyramid page closely, especially the part that calls the North Slide "one of the two most 'infamous' hiking trails in the NH White Mountains". Well, that which does not kill you makes you stronger, and I am definitely a better slide climber now. But I'm getting ahead of my story. My advertisement had been answered by Mountaingirl, a stranger who quickly satisfied me over email that she was equipped and fit for a winter hike. I picked her up a few minutes late (I'm never on time in the early morning), about 7:15 AM. When I swung open the trunk of the car so she could deposit her backpack (a nice midsize model, packed tight as a drum, with a shiny ice axe neatly tucked alongside), she stared in disbelief. "That's your backpack?" she asked. Indeed it was: the same day pack I use in summer - a rather small one. I had outfitted it with a pair of Thermoses full of piping hot water, and stowed a pair of snowshoes down the back (not really planning to use them, but figured I'd practice carrying winter gear), but visibly it was mostly empty. I had food, crampons, and a few emergency things in there, but with the weather projected to reach 33 degrees farenheit (0 C) during the day, compared to the ten degrees (-10 C) we were enduring as we stood by the car, the pack was chiefly there as a receptacle for when I'd start peeling layers. Fast and light was my plan. Mountaingirl, in contrast, was packing a Jetboil (she planned to practice cooking lunch under backcountry conditions) and various other stuff I didn't consider necessary (including a couple extra liters of water), mostly as extra weight "for training." This was supposed to be a short and easy hike, so this extra weight didn't worry me. If we could beat book time by just a few minutes, we'd be back at the car before sundown. The forecast had been for a 30% chance of snow that Sunday, but as we left Boston and headed north on Interstate 93 it began falling thickly. It was cold, dry snow, less dangerous to drive on than the previous weekend's freezing-point stuff, but it wasn't plowed yet. Within a few miles of boston we counted ten crashes or wipeouts, and two rollovers, before we stopped counting. Having slipped off the road myself just a week before, I took it slowly. This meant, of course, that we’d have less daylight hiking time. Knowing that Tripoli Road, the usual route to the southern Livermore trailhead, would be closed for the winter, I'd spent a fair amount of time plotting possible alternate approaches. On one map I'd spotted some roads leading from near the Snow's Mountain ski parking lot and ending right at the trailhead, but I didn't know if these would be plowed, or even if they really existed: the same map had the Livermore Trail marked as "Livermore Road". (As I write this I've got the _Guide_ beside me. It turns out these roads are mentioned in the "Geography" section for Waterville Valley, but I hadn't noticed this earlier.) So I'd also carefully mapped out the trails maintained by the Waterville Valley Athletic and Improvement Association, one of which runs from the Snow's Mountain lot due north one mile to the Livermore Trail. I needn't have worried: the Livermore trailhead is accessible year round, and is popular with cross-country skiers. There are many well-marked ski trails leading off the Livermore trail, and part of the trail is actually groomed by the town of Waterville Valley. We started hiking at 10:30 - only an hour behind schedule, not bad considering the driving conditions. Our hike had a book time of seven hours, but by going just a bit faster we could still be down before dark. It was very obvious that the Livermore trail had once been a road. We could easily have driven the first couple of miles if the access from the parking lot hadn't intentionally been blocked by a couple of boulders. It was wide and, frankly, boring. It wasn't even steep enough to warm us up - our jackets stayed on. We looked a little silly, with snowshoes or an ice axe sticking up from our packs, as we passed the only other pedestrian on the trail - a matronly woman out for a stroll, who was packing nothing at all, not even a hat or gloves. Eventually (half an hour faster than book time, of course) we reached the southern endpoint of the Tripyramid trail. By this time we'd left all the cross-country ski trails behind us and had entered the WMNF. There were a couple of inches of powder on the ground, a fair number of footprints, but we were finally starting to get that backwoods feeling. The Livermore "trail" even began sloping upwards a bit - but it was still twenty feet wide. Passing the south end of the Tripyramid trail, by which we planned to return, we continued a mile on the Livermore trail to the northern end of the Tripyramid loop, where the hike would truly begin. Around noon we crossed a small stream and started up the Mt Tripyramid trail. As I expected, there were no footprints here - we were the first to try the North Slide after snowfall. With a confident swing in my step I took the lead. The trail from Livermore Road to the Slide was not hard to follow despite a few blowdowns and some areas where it was hard to distinguish trail from stream. The snow wasn't deep and the blazes were pretty frequent. After about a quarter mile of easy travel the trail turned southeast and started a bit more steeply. We slipped a few times when we had to clamber over small boulders covered with a frustrating mixture of water, moss, ice, and snow, but this wasn't enough to slow our pace. About half a mile from the Livermore trail, however, the trail wanders onto the bottom of the North Slide and disappears. I was still in the lead when we reached this spot. The trail aimed straight up (OK, about 45 degrees of slope, but straight towards the top) an open slab about ten or twenty feet long toward a wall of evergreens, then traversed either left or right - there were gaps in the trees on either side, and from below I couldn't tell which was the best way. Ten or twenty feet of slab with one or two inches of snow on it? No problem at all! Though the voice of reason warned me this would be a safe place to stop and put on crampons, I simply friction-climbed it. I was about to grasp a friendly tree branch at the top when my right foot slipped on some frozen moss and I slid down three or four feet to a small sapling. I tried to climb back up a few times, eventually succeeding, but then realized that to traverse in either direction would be impossible without crampons. From where I was I still couldn't see whether it would be best to go right or left, but I could see that in either direction there would be enough exposure to cause me some serious harm. I called down to Mountaingirl that it was time for crampons. While I was fiddling with mine (they're the kind with rings instead of real buckles), Mountaingirl went ahead a little way and found that the way onto the slide was to the right. I caught up with her and the real fun began. Though it had been snowing steadily all night, and the snow never stopped during the day, the slide was exposed to the wind, and had very little accumulation. In a few spots near the bottom the rock was totally bare, though generally there was at least a quarter inch of snow - just enough to make friction climbing with bare boots impossible. At the very bottom there was some liquid water running down the southern edge of the slide, but higher up the snow wasn't melting. We'd find verglas ice from time to time just when we needed it least, but not enough to sink an ice axe or even a crampon into. Generally, the slabs were too featureless for rock climbing, and the rare holds were hidden under snow. It would have taken hours to advance just a few feet if we tried to clear the snow away. The only practical way forward was to use our crampons as rock aid - letting the points catch in any little dimples in the rock. For handholds, sometimes there were cracks in the bedrock. Sometimes the slope was gentle enough that we could stand and use poles in the normal way. Once or twice there was enough snow that I could cross my poles in front of me as a sort of snow anchor (combined with the friction of the rubbery handles and baskets) that was just good enough as a handhold to allow me to shift my weight. Most often, though, I would crawl, holding my poles just above the baskets like Robin Hood climbing a castle wall with a pair of daggers. It was amazing how often we resorted to techniques that would have been more appropriate on an overhung rock climb - contorting in various ways to get from one tree or crack to the next, or to hurry past a doubtful foothold. My arsenal of rock-climbing techniques is admittedly limited, but I constantly found myself thinking, "I've never done that in crampons before." To illustrate, I’ll describe a basic technique from the very beginning of the climb. Mountaingirl had led the way to the right out onto the slide, and now was turning to climb up it. We found ourselves at the bottom of a miniature "bowling alley" - a pair of slabs arranged in a V-shaped gutter, only about thirty feet long. This would be a trivial obstacle when dry. Even when wet, you'd just jam your toe into the bottom of the V for increased friction, trust the carbide tips of your poles on the side slabs, and walk right up. We did the exact same thing, except we it was our toe-points we were jamming into the crack between the slabs, through the snow. I had a few other typical thoughts on that very first stretch. One was the realization that I wasn't paying enough attention to my distance from Mountaingirl: if she slipped, I'd be unable to catch her fall, and get a mouthful of crampons for my trouble. The other was an interior monologue that repeated like a pop-song chorus: "well, there's no turning back now. You saw how hard that last bit was to go up. Do you want to try DESCENDING that?" Later I discovered I had a gift for interior dialogue as well. A typical exchange went like this: "I'm glad I'm not all by myself up here." "Yeah, this way if you (I) fall, your (my) death will have a witness." Most of the climb is a blur in my memory. We switched lead several times. It was a lot of effort. "1200 vertical feet in half a mile" is a true statement, but doesn't capture the cumulative effect of snow, cold, clouds, and fatigue. It's hard to think when you're crawling, or when you're worried about whether your foot will stay where you've put it. I was very glad when I had Mountaingirl in the lead, testing for holds with her ice axe. Considering the extra weight in her pack, her performance was impressive. I never saw her take more than a sip of water, or any food at all, either: "training", she said. After a couple of hours on the slide, we were further delayed when my crampons began working loose. The left one came off first. Not exactly an ideal event when you're a few hundred feet up a slide. But I got it back on, and we continued. Then the right one came loose. I tightened it, but it came loose again. And again. Each time, I had to find a relatively safe spot to sit down, take off my gloves, adjust the straps, dry my hands, put the gloves back on. The delays were getting frustrating. Once the top of the slide was within sight I gave up on my right crampon completely. I just let it dangle beneath my foot, and by stepping across it I had a somewhat effective instep crampon. Fortunately, by that point the slide was not quite as steep as before. At the summit (North Peak), we briefly considered our options. We were at about the midpoint of our planned hike with about an hour and a half of daylight left. Our planned route had a book time of two hours to the Livermore trail, but would take us down the South Slide. We'd doubled book time on the North Slide, and we didn't want to risk being further delayed, especially after dark. So we descended the Pine Bend and Scaur Ridge trails, which were ridiculously easy even in the fading light. We were back on the Livermore trail before sundown. The walk out was, once again, boring. We joked about going back and doing the South Slide too. I plan to, but not in December. The North Slide would probably make a fun snow/ice climb with some more snow cover, and plenty of time set aside to climb it. But don’t take it lightly. This trip sounded like one which you will never forget. I put this mountain on my summertime list (I need to do class 2's and 3's before heading to Washington State). An ascent of 1200' in half a mile is more like 27 degrees, but it sure looks steeper. Wow, sounded like a "fun" time. Glad it all worked out for you. I was up at Waterville skiing today and spent some time checking out the Tripyramids across the valley...the north slide looked challenging and this confirmed my suspicions! I'll save it for a summer hike. Great trip report man! It's good to hear the ending the way it did. Just being in the Whites in summer I always worry about taking the peaks to lightly and getting myself into a freak incident and then my mind changes back to, "keep your head on straight." These mountains can be as bad as any mountain anywhere and your story goes to show that. Nice job on the narrative and thanks for sharing! Take care! This looks like a nice fun day out you can usually take things easy in the whites as long as you bring some weather protection.